Voting technology is one obstacle to wider use of ranked-choice voting. Although groups like OpaVote have had open-source fixes for years, US jurisdictions tend to rely on commercial vendors. A decade ago, many of them resisited developing the technology. Now, of course, voters can “complete the arrow,” as is done in San Francisco, or bubble in a candidate-by-ranking matrix, as was done in Maine last week. The challenges get thornier with STV elections. Due to the “multi-winner” nature of a race, there sometimes are very many candidates. That can result in confused voters and burdensome vote counts. Only in 1991 did Cambridge (MA) solve these problems by computerizing its electoral system. That could have happened as early as 1936, when many cities still were holding STV elections. Among the most persuasive arguments against P. R., in spite of their essential triviality, have been the objections that it required several days to get the result in a large election and that it required paper ballots and hand counting, both of which in plurality elections without the safeguards of a central count have acquired an evil reputation. In connection with the possible early use of P. R. in New York City, where these objectives would be stronger than ever psychologically, an effective answer to them has now been devised. Voters would use a series of dials to rank candidates, one through 20. Then, as some will recall, the machine would record a voter’s votes when they pulled the lever to open the curtain. Opening the curtain punched the holes into the punch-card ballot. Precinct-based error correction. A voter could not give the same ranking to more than one candidate. Nor could a voter skip a ranking. Freedom of choice. A voter could rank as few candidates as they wanted. They also could rank as many as they wanted. Although the machine was built for 20 rankings, there appears to have been accommodation for write-in and additional candidates. Finally, a voter could go back and change their mind about a ranking. Early “cyber-security.” Now we worry about nefarious actors loading malware onto touchscreens. Back in the 1930s, however, the worry was that poll workers might stuff a ballot box or throw out ballots they did not like. IBM’s solution was simple. Poll workers would not have access to individual ballots. Once a voter voted, the ballot fell into a sealed container, only to be opened in the central-count location. Why the machine did not catch on remains a mystery. IBM appears to have been pitching it to New York City in advance of the November referendum, which put STV into place from 1937 to 1947. Those passing by 41 Park Row could see a demonstration model at the Citizens Union office. It is a shame that New York (and other cities) did not go with the system. According to Mott (1926), the average invalid-ballot rate in 19 elections to that point was 9.1 percent. My data reveal invalid rates of up to 18 percent (Manhattan and Brooklyn, 1941). Part of this was abstention altogether. Another part was the lack of interest in discerning voter intent, handling skipped rankings with compassion, and so forth. IBM’s machine, however, would have addressed some of those issues, all while educating voters at the same time that they voted. Thank you, Sen. Claire McCaskill (D-Missouri), for a wonderful quote about how presidential systems can fracture electoral incentives within a party. Quick political science lesson. Political parties in the US are non-hierarchical. * That’s a fancy way of saying neither their candidates for office nor their platforms are determined by a central authority. In other words, the DNC chair is not worth getting all worked up over. If you want to change the party, get some candidates who can win primaries for state legislative and congressional races. Oh, and make sure that said candidates also could realistically win the general election. That is all. * As explained in Chapter 6 of A Different Democracy. Galvanized by the first ever ranked-choice-voting (RCV) win in a U.S. state, reformers just hours ago held a conference call to build their movement. Ranked-choice voting is a set of voting rules more kind to “outsiders” than our ubiquitous plurality system. Given the unusual strength of America’s two-party system, why do outsider-friendly electoral reforms ever win? My answer is: a replacement institutional template, losing-party self-interest, and ruling-party disunity. 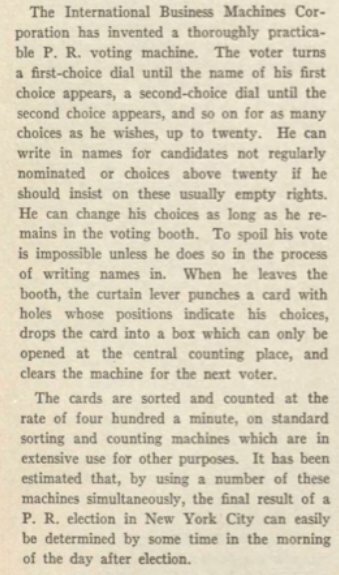 In a recently published paper, I show how this logic can explain the spread of “multi-winner ranked-choice voting” (i.e., proportional representation or PR) in the first part of the 20th century. Losing parties and disgruntled ruling-party factions promote voting-system change in a bid for policy-making influence. Voting reform organizations supply the replacement template. Does my answer also explain the RCV win in Maine? Is that enough to buy my argument? If the answers are “yes,” reformers would concentrate on jurisdictions with sizable out-parties and fractious ruling parties. Americanist political scientists would also change the way they think about election “reform.” The dominant trend for more than a century has been to see party and reform as exclusive. Fifty years ago, we would have read about conflict between “machine politics” and “good government.” Now we read about “activists” versus “compromisers,” legacies of Progressivism, and reformer “process-obsession.” What if party itself were a critical reform ingredient? As Jessica Trounstine reminds us in her excellent book, Democratic boss Thomas Pendergast was more than happy to turn the model city charter (without PR) to his own “machine” ends in Kansas City. 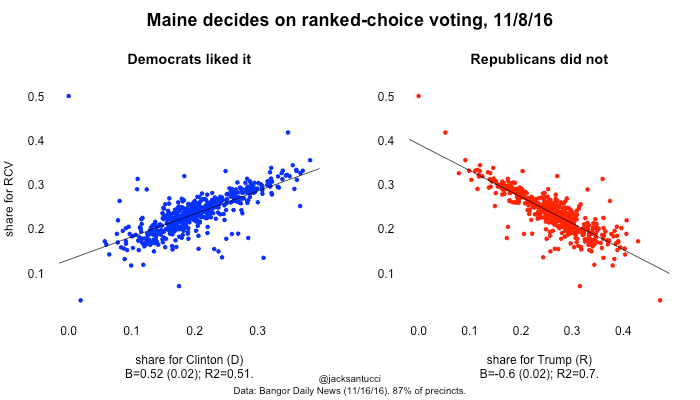 Let’s see if my template-loser-faction model explains what just happened in Maine. Efforts to enact RCV began in 2001. 2) did not expect “independent” voters’ ballot transfers under single-winner RCV to help elect its candidates. Proponent of record for Question 5: An Act to Establish Ranked-choice Voting. Liberal on some economic issues, but supports consumption taxes and income-tax reduction. Two-time independent candidate for governor. Liberal on the environment, ambiguous on economics, but not a conventional Democrat of yore. Endorsed independent candidate Angus King (over the Democrat) to replace outgoing Sen. Olympia Snowe, a famed “moderate” Republican. Last month I predicted that a coalition of regular Democrats and “the independents” would put RCV over the top. Republicans threw me a curve ball by endorsing RCV the very next day, but, as the proprietor of this blog has written, such endorsements can be strategic. If I was right, Democrats and “the independents” should have voted for RCV, but the Republicans should not have. Below I give a rough test of these hypotheses. Here are precinct-level results of the vote in favor of RCV by the vote for each major-party presidential candidate. (Vote shares are overall, not of the two-party vote.) This is preliminary. I only have data so far for 87 percent of precincts, the state has not released official results, and I have not looked at the correlation of RCV support with partisanship in other offices. I don’t yet have a way to get at behavior by “the independents.” Finally, I have not yet run an ecological inference analysis, but I plan to remedy all this later. As you can see, Democrats seemed to like RCV, and Republicans did not, at least as revealed by presidential voting. Why don’t “the independents” simply join the Democratic Party if they dislike current Republican positions as much as the Democrats? This is what’s really interesting about the adoption and use of RCV. I argue that groups in reformist alliances do not plan to cooperate on all pieces of legislation. Let’s say Maine ends up with an “independent” governor or a sizable contingent of “independents” in its state legislature. I would not be surprised if we see them working with Democrats on some legislation (e.g., “social”), then with Republicans on other bills (e.g., taxes). Why don’t Democrats foresee this possibility? Perhaps they recognize that single-winner RCV is not the same as PR. Consequently they may reason that “independents” will not become a bargaining force. Rather, “independent” ballots will bolster the position of Democrats in government. Then why are “independents” going along with a reform that’s good for Democrats? Perhaps they disagree with Democrats on who’s likely to benefit from strategic voting. As Gary Cox reminds us, strategic voting depends in the end on voter expectations, shaped by elite messaging about precisely which party or candidate is “hopeless” under a given electoral system. The perception that RCV has made elections kinder to outsiders is important. If there really are many sincerely “independent” voters, “independent” candidates may get a toehold in government. I’ve had nothing to say here about the US election. Well, I voted today. I am glad it is almost over. It has been depressing to watch this campaign. I offer this space for readers who feel F&V should have such a space. That is all from me (for now). At Think Progress, Ian Millhiser offers another in the recent series of examples of American columnists noticing comparative politics. This is good! Millhiser suggests we look to Chile’s current presidential democracy for models of how to prevent government shutdowns. As he notes, correctly, Chile’s president has exclusive power under the country’s constitution to propose legislation in areas relating to finance and budget, along with “urgency” provisions and restrictions on congressional authority to change executive proposals. In other words, a presidential (separation-of-powers) model does not necessarily have to leave the executive dependent on legislative initiative to pass a budget or other financial matters. While the recognition of other models is good, I am afraid I have to stop short of advocating the Chilean solution. If I decried the possible “Latin Americanization” of US presidentialism during the previous administration, I hardly can advocate it now. The draft chapters for a co-authored book project in which I am involved are posted on my academic pages for anyone who might be interested. It is often said that the United States has an exceptional democracy. To what degree is this claim empirically true? If it is true, in what ways is US democracy different and do those differences matter? What explanations exist for these differences? The study examines the choices made by the designers of the US government at the Philadelphia convention of 1787 and the institutional structures that evolved from those choices and compares them to 30 other democracies. The basic topics for comparison are as follows: constitutions, federalism, political parties, elections, interest groups, legislative power, executive power, judicial power, bureaucracies, and public policy. Each chapter starts with a discussion of the feasible option set available on each type of institutional choice and the choices made by the US founders as a means of introducing the concepts, as well as discussing how specific choices made in the US led to particular outcomes. This is done by looking at the discussions on these topics from the Federalist Papers and the debates from the Philadelphia Convention. This approach allows a means of explaining the concepts in a comparative fashion (e.g., federal v. unitary government, unicameralism v. bicameralism, etc.) before moving into the comparisons of the US system to our other 30 democracies, which make up the second half of each chapter. Each chapter contains an explicit list of specific differences between the US and the other democracies as well as comparative data in tabular and graphical formats. The current draft of our book has 64 tables, 16 figures, and 10 text boxes. All of the figures and tables contain comprehensive comparative data featuring all 31 cases (save in a handful of instances) or specific thematic subsets of the 31 cases (e.g., presidential systems or bicameral legislatures). The book is now under contract with Yale University Press. Comments are welcome (but act fast! ).